Wittenberg University received a B.
Washington Monthly's ranking of 97 out of 246 of Liberal Arts Colleges - Overall Rank was a major contributor to this grade. "What they sell in the brochure is what you get and more," exclaims one satisfied student at Wittenberg Universitya "great place to learn and grow as a person," according to its students. A unique trimester system keeps academic life interesting and the financial aid office receives especially high praise." What are the top 3 reasons someone should attend Wittenberg University? What is a typical Wittenberg University student like? Describe the type of person that should attend Wittenberg University. The typical Witt student varies, introvert or extrovert . We welcome people of all personalities so anyone should come attend! Wittenberg's general education requirements emphasize a solid liberal arts background. The most popular majors at Witt are Management and Education, but students also rave of Witt's English program. Wittenberg's applicant pool is small but quite solid. The same can be found inside the classroom where professors understand that personal attention makes a huge difference in how students learn. The fact that many encourage conversation after class or host gatherings in their homes only supports their passion for teaching and their desire to ensure students' success. In addition to offering course work in the humanities, arts and sciences, Wittenberg also offers distinct academic programming in non-traditional areas in most liberal arts colleges, including business, computational science and teacher education certification. Students who attend Wittenberg tend to rank in the top quarter of their high school class, and many are fully engaged leaders, who are involved with everything from student government to athletics. It's no surprise that Wittenberg has more than 120 active clubs to cultivate all interests, as well as 23 varsity sports that compete at the highest levels in NCAA Division III. What are the top 3 things that students do for fun at Wittenberg University? The top 3 things Witt students do for fun would be hanging out in the hallow, playing frisbee golf around the campus, and taking trips to the local events happening. Campus housing is available for undergraduates. Housing deposit : $400.00. Housing deposit due : Jul 1. Freshman allowed to have car. Pets allowed in dorms. Facilities: observatory, east asian art collection, martin luther library collection, humanities and technology center. The average student pays $27,608 for tuition, fees, and other expenses, after grants and scholarships. Total stated tuition is $37,230, in-state and on-campus, before financial aid. Learn more about financial aid at http://www4.wittenberg.edu/admission/financials/. 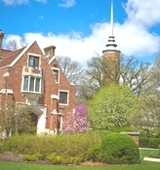 Estimate the net price for you at http://www4.wittenberg.edu/admission/facalc/facalc.html. The typical (median) early career salary of Wittenberg University graduates is $41,900, according to Payscale. Wittenberg University participates in the NCAA Division III for college athletics. Want more info about Wittenberg University? Get free advice from education experts and Noodle community members. My name is Samuel from Ghana. I want to find out what level will an applicant with a HND from a polytechnic be admitted to if he wants to further his education with Wittenberg? Hello Samuel! Glad you are applying to Wittenberg University!